Arsenal were formed in 1886 and have been a League team for 116 seasons; from 1893/94 onwards. They are currently 5th in The Premier League. Manager: Unai Emery (In charge since 23 May 2018). Arsenal were known as Dial Square until 01Aug1891, Royal Arsenal until 01Aug1893 and Woolwich Arsenal until 01Aug1913. Founded in 1886 in Woolwich, South London, Arsenal are one of the most successful teams in England. The club was set-up by a group of Scots working at the Royal Arsenal in Woolwich. They initialy used the name Dial Square but changed it to Royal Arsenal in 1893 when they moved back to the Manor Ground (previously Manor Field) from the Invicta Ground. They had previously caused uproar amongst their fellow clubs in the Southern League by going professional, like the Northern teams who had set-up the Football League in 1888. Arsenal saw that this was the way forward and were the first Southern team to join the League in 1893. The club has worn red shirts since their formation. Two former Nottingham Forest players were founding members of the team and wrote to their old club to ask for help. Forest sent a set of shirts and a ball - Arsenal wore red shirts, white shorts and dark blue socks initially. The distinctive white sleeves were added in 1933. The team had a large support at this time and were reasonably wealthy; paying £4,000 to purchase Manor Field and then to make it into a first-class ground. The team performed well initially, gaining promotion to Division One in 1904 but the fact they were based so far away from the other League teams meant their attendances started to dip and they were on the verge of bankrupcy by 1910. The Fulham chairman, Henry Norris, took the team over and initially tried to amalgamate the two clubs. This was met with strong opposition so didn't happen. Performances on the pitch picked up temporarily but they were relegated after a dreadful season in 1912/13. With Plumstead not having the best transport links, Norris announced that the club would be moving to Gillespie Road in North London. Orient and Tottenham both objected without success and The Arsenal ('Woolwich' was soon dropped from the name) started building the stadium that would become The Arsenal Stadium in Highbury. 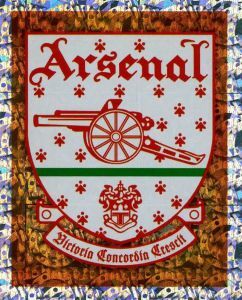 The team retained some links with their roots via the club crest of a cannon and their nickname; 'The Gunners'. Arsenal's ambition has never been in doubt and in 1919, despite only finishing 5th in Division Two in the last season before World War One, they somehow persuaded the League that they should be one of the two extra clubs added to the First Division after the war. Derby, and Preston were promoted having finished in First and Second place and Arsenal effectively replaced Tottenham who were relegated. With the appointment of Herbert Chapman as manager in 1925 the clubs fortunes went from strength to strength. Chapman had successfully appealed against a total ban from football following the Leeds City player payments scandle that resulted in the club being wound up and replaced by Leeds United. He had enjoyed subsequent success with Huddersfield but then led Arsenal to their first major trophy; the FA Cup, in 1930. They then won the League twice before he died suddenly in 1934. His lasting legacy was the renaming of Gillespie Road tube station to 'Highbury'. Arsenal's success continued with three more League titles and another FA Cup success. Although they tailed off towards the end of the decade, they picked up again after the war, winning the league twice and the FA Cup once. Their fortunes waned again, although they never came close to relegation and remain the longest standing top-flight club. When Bertie Mee (the club's physio) took over in 1966 he took them to two League Cup finals, which they lost but then they won their first European Trophy in 1970; the Inter-Cities Fairs Cup. This was followed by their biggest achievement; a League and FA Cup double in 1970/71. Although they reached several finals after this, they only won one; the FA Cup in 1979. The appointment of George Graham in 1986 was the start of another golden era for the club with the League Cup being won at last in 1986/87 and then the League in 1988/89. They then won the League again in 1990/91, the FA and League Cups in 1993 and the European Cup Winners Cup in 1994. Graham was dismissed in 1995 following allegations of illegal payments. Arsene Wenger's appointment in 1996 started another period of dominance by the North London club. His focus on signing young, foreign talent was not popular with English purists who resented his teams that didn't feature a single English player but his teams built to a peak that resulted in the Premier League being won in 2003/04 without the loss of a single game. This led to Arsenal fans dubbing the club The Invincibles, a name previously given to the all conquering Preston team of the 1880s. In 2006/07 the club moved to the Emirates Stadium in Ashburton Grove about 500 meters from Highbury. This 60,000 all-seater stadium is the biggest club stadium in London and is full for most games. Arsenal felt that a stadium of this size, and the revenue it would generate, would enable them to continue to challenge at the top of the English game.